“The way to a man’s heart,” so the saying goes, “is through his stomach.” I’m inclined to agree. An inexorable link exists between cooking and love. My daughters, who love to bake, are the “proof in the pudding.” Whether conjuring up tangy lemon poppyseed muffins, my favorite birthday cake, or “melt in your mouth” bittersweet chocolate meringues, they always seem to add a dash of love to their culinary endeavors. Baking is their way of nurturing, of filling those they care for with sweetness of both a physical and metaphysical kind. And I am the lucky, waist-band expanding, recipient of that sweetness. 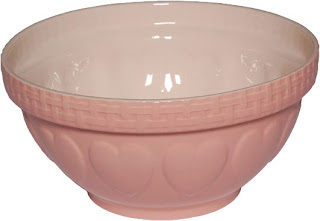 So it’s no surprise that the Mason Cash Romantic Heart Mixing Bowl is one of my favorite finds of this – or any- season! Currently available in pink, this 12” mixing bowl, decorated with a whimsical frieze of chubby hearts, is the perfect gift for Valentine’s Day. But you’ll find yourself using and displaying it year round. There is simply nothing else like it! Present it to a loved one filled with fresh-cut camellias from the garden, sappy heart candies from the dime store, or a split of champagne on ice. There is plenty of time for baking, later. Center a rack in the oven and preheat the oven to 400 degrees F. Butter or spray the 12 molds in a regular-size muffin pan or fit the molds with paper muffin cups. Alternatively, use a silicone muffin pan, which needs neither greasing nor paper cups. Place the muffin pan on a baking sheet.In a large bowl, rub the sugar and the lemon zest together with your fingertips until the sugar is moist and the fragrance of the lemon strong. Whisk in the flour, baking powder, baking soda and salt. In a large glass measuring cup or another bowl, whish the sour cream, eggs, vanilla, lemon juice and melted butter together until well blended. Pour the liquid ingredients over the dry ingredients and, with the wish or a rubber spatula, gently but quickly stir to blend. Don’t worry about being thorough-a few lumps are better than overmixing the batter. Stir in the poppy seeds. Divide the batter evenly among the muffin cups.Bake for 18 to 20 minutes, or until the tops are golden and a thin knife inserted into the center of the muffins comes out clean. Transfer the pan to a rack and cool for 5 minutes before carefully removing each muffin from its mold. Cool the muffins completely on the rack before icing them.